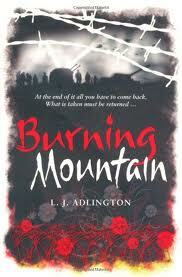 This is an arresting approach to telling a Second World War story from the German point of view. Craig and Denise are kids with elderly neighbours called the Shepherds and a mother who a tad neglectful and too busy to notice what they are up to. Denise discovers the strange old foreign lady next door who seems to be a bit loopy – married to a man who appears a bit distant. The old lady seems to latch onto Denise and tells her stories about Vittoria a beautiful young Italian girl and a German soldier Peter Shafer caught up in the desperate times of war. Craig is fascinated by these stories because he is obsessed with soldiers and wars; their elder brother is a paratrooper in Afghanistan. Slowly the old lady’s tale grows and Denise is fascinated by this young girl who struggles to survive in Italy, starved of food, stealing to stay alive, caught between German occupation and the Allies invading. Peter Schafer is a crack shot, part of a German group of soldiers holding Monte Cassino, a monastery in a strategic position, which is preventing the Allied relief of Rome. Peter and Vittoria's lives cross - when Vittoria steals Peter's diary and their paths keep crossing whether they like it or not. There is also a link to the eruption of Mount Versuvious in AD 79 and the ruins of Pompeii that play out in the story. Meanwhile Denise is struggling with her own anti-war feelings and unease about the news that her elder brother is missing in action. History and current reality seem to collide and it is the old lady’s tale of young Vittoria’s story that help Denise comes to terms with her own emotions and vividly brings history alive. Craig and Denise use Wickipedia to fill in the details and suddenly their elederly neighbours become very interesting indeed. A lively and compelling story that takes an interesting perspective to German WW2 history at a time when the Allies are war all over again in many places.